In the Valle d'Aosta region is produced a special kind of bread made with rye and wheat flour that gives the bread a dark colour and a brown crust, from which the name of black bread.Recently joined to the list of "traditional recognized food products" of Valle d'Aosta, traditionally the bread was prepared once a year, involving the whole community: the women kneded and the men took care of the wood stove, and when the bread came out of the oven, was a great party. After the cooking, the bread was dried on special wooden racks called “ratelë” for several months. Once dried, the bread becomes very hard and it is cut with the traditional "coppapàn", a kind of iron knife that you can still find in the handicraft shops. The result of this process was a sort of delicious biscuit excellent to be soften putting it for a few minutes to soak in the soup, milk or, failing all else, in the water. 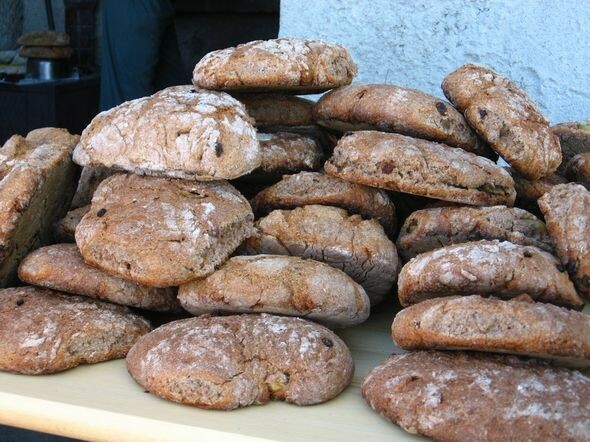 Today you can find it also as a freshly-baked product even stuffed with goodies such as raisins and dried fruit for special occasions.This special bread is so famous that every year in August takes place in the city of Ozein the festival named "Fehta dou pan ner". The event is held around a very old wood-burning oven which is brought back to life every year for the occasion. Visitors can follow all stages of preparation and baking of this typical bread, until the tasting! If you want to taste this delicacies and take this opportunity also to make an holiday in Italy, don't hesitate to visit our partner site www.leibtour.com and to request them a quote.